World of Shorts Magazine is published by Daazo.com. It focuses on the short film sections of A-category film festivals like the Berlinale, Cannes, and Sarajevo. Its first printed edition was available for the audience of the Berlinale in 2012. The Mapping your Mind section is one of the core features of the magazine, a unique channel to connect with the short films competing at the festivals. You can also buy our great daazo bag. It's compulsory for any filmmakers. - The Daazo bag is currently out of stock, but we will receive some soon! What is neccessary for a filmmaker? 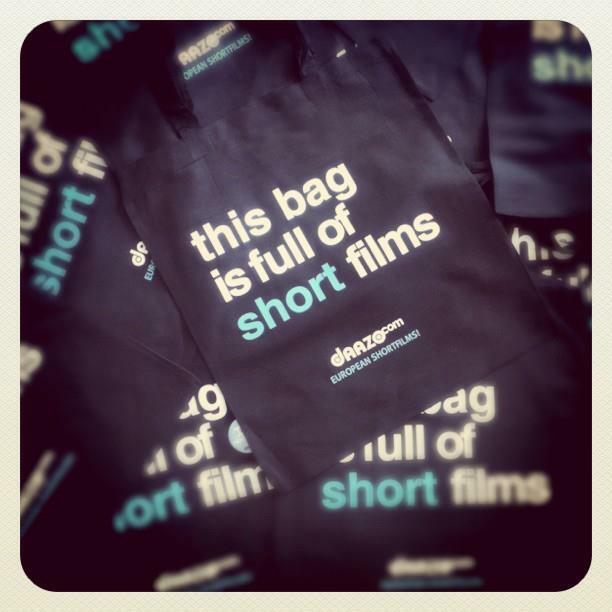 A bag full of short films! Our great-looking, black, linen bag tells all about you. It's ideal to show off at film festivals, (put your screeners and flyers in it! ), and afterwards taking it to the beach with your flip-flops in it! The Venice 2014 issue of Daazo.com's World of Shorts magazine is covering again the short section of the festival and introduces alternative ways of a successful festival strategy, along with an extensive festival panorama. The Cannes issue of Daazo.com’s World of Shorts magazine discusses the short film programmes of the film festival as well as the alternative ways of raising funds for film production. The magazine is packed with useful advice for filmmakers. The Berlinale issue of Daazo.com’s World of Shorts magazine discusses the short film programmes of the film festival as well as the importance of preparation and training when making short films. Short Films in Museums. It focuses on the festivals’ short film section with interesting interviews and insightful articles. It focuses on the festival’s short film section with fantastic drawings, interesting interviews and insightful articles. In the latest issue of WoSh, we are dealing with the value of creativity in the filmmaking process. You can look around the Berlinale Short film programmes, read an interview with Maike Mia Höhne, Matthijs Wouter-Knoll. You can know more about how to be a festival darling and explore the world of short film financing with us. In this printed version, you can even make a two frame flip-strip animation! In this issue, readers can find out all about the behind-the-scenes secrets of Berlinale Shorts and the Talent Campus, find out about the Hungary 2011 project, and read about the Cinéfondation and self-branding. We also introduce the Teddy Award and the European Short Pitch. A magazine published to accompany Daazo's touring short film contest, the Visegrad issue introduces the finalists and their works, the current film scene in the 4 Visegrad countries. You can read about a fruitful producer-director relationship as well as a review of the history of Central-European short film. After the success of the first, online-only edition in 2011, the Cannes 2012 issue - this time in print - reviews the short film competition programme of the Festival, discusses authors' rights and new trends in filmmaking.You can read the success story of the award-winning director Kornél Mundruczó and find out how to sell your short film and how to make a successful producer-director team . The first printed Sarajevo edition was the second time we'd covered the festival. In this magazine, among others, we discuss the chances of short film distribution, you can read about film markets, find out more about the Talent Campus "franchise", and get tips on zero budget filmmaking. And of course you can view the “Mapping your Mind” drawings.